Imagine what excitement the announcement of a grand quilt contest with $7500 in prizes would have stirred during America’s Great Depression! Sears devised just such a contest as a part of the 1933 Chicago World’s Fair. Prizes were awarded at the local level, regional level and national level. 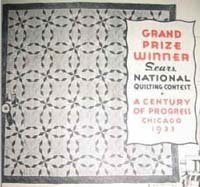 Sears had encouraged contestants to make quilts that reflected the theme of the fair, "A Century of Progress". But the judges had other ideas, awarding the top national prizes to traditional quilts. The pictured winning quilt was a skillfully made traditional quilt in the Diamond Star Pattern. The feature that made it outstanding was its beautiful stuffed quilting. Still, the judges blatant disregard for the guidelines caused disappointment for many and indignant anger by some. But this was minor compared to the greater scandal of this competition, a shocking breaking of a rule that wouldn’t be generally known for years. Contestants were required to sign a form proclaiming that they alone had made the quilt. First prize winner, Margaret Caden, did not hesitate to sign as much. Caden was the owner of a shop selling fine gifts, including quilts, to the wealthy. No one of any status questioned her. There must have been murmurings among friends and neighbors but it wasn’t until years later that the truth came out. The seamstresses, who made quilts for the shop and would continue to make them for years to come, already knew. A select few of Caden’s best quiltmakers had actually made the quilt. It's likely that Caden never even picked up a needle. Why wasn’t there an outcry from these women who got no recognition nor a cent of the prize money? I think you already know. It was the depression and these women’s families could barely make ends meet. They dared not complain for fear of losing their livelihood.